How Do I Know If I’ve Found a Good Deal? We speak with investors of all kinds from all over the world on a fairly regular basis. One of the most basic principles of our company is that we don’t tell investors what a “good deal” looks like. There are many reasons for that, the most obvious is that you are investing YOUR money, so you, ultimately, decide what a good deal is. Some of our clients are looking to ditch their day jobs and need monthly income. We work with those investors to identify buying criteria that will move them closer to their goals. Some investors just want to park some cash in a property that they think will increase in value over a specific length of time- we direct those investors to different types of property in different parts of the valley. Finally, we work with some investors that have a great deal more experience and resources than we do, and with those investors, we simply go out and find what they are looking for and manage it appropriately. Our job is to educate you about the dozens, if not hundreds, of ways you can make money investing in real estate. From there, you find where your comfort level is, and we start looking for a property that matches, that will help you achieve your goals. Some investors come to us having already done thorough market research and we get right to work. Others need a bit of help learning about investing, our local market and what kinds of returns to expect. This is where we can really help someone start to make progress in their investing future. Essentially, there are two types of returns investors look for; cash flow and appreciation. The X% Rule: A property that has a monthly rent of a specific X% of the purchase price, assuming it will produce good, positive cash flow. It’s simply a quick way to analyze a property, but many people feel that If you pay $100k for a house and rent it for $1,000 per month, you are almost guaranteed to have a solid investment, at least from a cash flow perspective. Cash on Cash Return: This measurement takes the down payment on a property and creates a % as an annual return you get via cash flow. For instance, if you put 25% down on a $200k property, you’ve spent $50k in cash. If your annual positive cash flow on that property is $5k, you have a 10% cash on cash return. Appreciation is a simple one- it’s how much the property has increased in value in the time you’ve owned it. Appreciation can come in a two different ways: forced and passive. Forced appreciation is when you fix up a house to make it worth more- it’s exactly what flippers do; buy a property under market value, fix it up in order to quickly force appreciation and sell it for the increased value. Many investors do this exact same thing, but rent the property out when they are done, which is commonly referred to as the BRRRR method, blog post coming on that topic in the near future. Passive appreciation is the increase in value of a property due to market conditions. Supply and demand has a positive effect on appreciation; more buyers than sellers make your property more valuable. Properties can appreciate If the city purchases the trailer park next door and creates a beautiful park, that cause your property to appreciate. Readers who are natives of the Boise area have watched what has happened in the Waterfront District in Garden City and the West End, and have a front row seat to watching neighborhoods go from being undesirable to suddenly being the most popular place in town. See the West End link in the previous sentence for an article from 2008 proving your window for that neighborhood has likely closed, but there’s always another opportunity around each corner. In 2018, the average appreciation in the Boise metro area last year were nearly 16%. That’s average- some areas were higher. That means if you bought a rental property in January of 2018 and had cash flow of $200 per month and did nothing to improve the property, you made nearly $35,000. For reasons we will explain in future blogs, for investors who are looking for advice on how to start, we usually recommend a reasonable blend of cash flow AND appreciation, which is actually pretty easy to find in the Boise area. So- what kind of returns are you looking for? How would an extra $35,000 (spending little to no time to make it) per year change your life? How Does Owning Investment Real Estate Effect My Taxes? Taxes. That big elephant in the room. Most people don’t really know exactly how their taxes are calculated, what is taken out of their checks and exactly where that money goes. It’s fair to say, every American has basically the same goal with their taxes; how can I pay the least amount of tax possible without spending the rest of my life in prison? Well, I have a solution for you- and it’s a simple one. Become a real estate investor. What’s that? You don’t think that’s possible? I beg to differ- read last week’s blog entry! While there are many ins and out of how your taxes are calculated and what can and cannot claim as credits or write offs, there is one concept that investors know inside out. Depreciation. It’s the secret to keeping your taxes reasonable and being able to hold on to properties over the long term while they appreciate and you scale your portfolio. Depreciation. As an investor or homeowner, you know that over a period of time, your property will be worth more money than it is today. The IRS knows that too, but they also know that a property needs love and attention to be inhabitable, to appreciate. If you don’t give your rental property love and attention, it will fall apart. The paint will chip off, the gutters will fail, carpet will be worn and destroyed, the roof will leak and eventually cave in. If investors aren’t providing and maintaining housing for renters, who will? Probably HUD, taxpayers, the government. The reality is, the government wants private landlords to provide and maintain housing for the people so that they don’t have to, and they motivate many an investor through depreciation. What exactly is depreciation? Depreciation is a credit investors are able to claim against investment properties and improvements associated with those assets. I’ve included a table below to give you an idea of how long it will take an investor to fully depreciate certain improvements, and keep in mind, “improvements” means anything in addition to the dirt under your building. Here’s a simple example, let’s say you bought a duplex for $275,000. If you look at the table below, the IRS says all residential rental buildings can be depreciated in equal installments over 27.5 years, so that means you get a $10,000 write of EVERY SINGLE YEAR for the next 27.5 years ($275k/27.5years=$10k/year). Now, keep in mind, that is only the depreciation, and that’s just the beginning of the tax benefits. Use a cell phone to communicate with your tenants or property manager? That’s a business expense. Do you drive by your property to make sure it’s being maintained? That mileage is a business expense. Pay your property taxes? Mortgage insurance? Bought a computer to help you manage your business? Those are all business expenses as well. The list goes on and on. Now, you have a tenant in your property. They are paying you rent, which is more than your mortgage, so you are making at least a few bucks a month while your tenant is paying your principle, interest, taxes and insurance. When you add in your business expenses and depreciation, at least on paper, your property will often be “LOSING” money. You aren’t taxed on income you don’t have- the depreciation is pushing your income from this particular property into the red. In reality, you are making some money month to month and your property is appreciating, but the cost of you running your business and maintaining the property will bring your taxable income in to the negative. In a nutshell, this is how people make money on rental property that they have a mortgage on, it’s pretty simple once you get the hang of it. Keep in mind, the above is a simplified version of reality. Boise TurnKey is not an accounting firm, and we encourage you to speak with your accountant before you make the jump in to investing. If you do not have one, we can refer you to someone who has a great deal of experience in residential investment property. If you have general questions about how a scenario like the one above could work for you, click the “contact us” link above and we’ll happily give you a more detailed and personal explanation. Investing in real estate seems exciting and lucrative- and it can be. The problem is there are infinite ways to go about it; single family rentals, multifamiliy rentals, apartment buildings, commercial, mobile home parks, storage units, wholesale, flipping, buy and hold, etc. I could go on and on. It’s confusing and intimidating as you begin to learn and explore options. In our opinion, the best way to start is by defining what your long term goal is and working backwards. Are you investing to supplement your income or replace your job? Do you love your day job, but think investing would be a fun hobby that happens to supplement your income? Do you want to retire 10 years earlier? The answer to those questions will help you define your long term goals, and you can work backwards to identify the short term goals that will help you get there. Ultimately, every investor’s goal is to have cash flowing, buy and hold rental property. In order to get there, you may have to build capital, which is where flipping or wholesaling might come in to play. Flipping and wholesaling are work. Real work. Hard work. Once you learn your market and understand how to identify and negotiate a wholesale or flipping opportunity, you can start to build some capital. So- your first deal. What do you need? Does it need to produce capital? If so, how much capital in how much time? How will you measure your return? If you plan to buy and hold, how will you measure your return on that investment? There are many ways to calculate a return, and in future blog posts, we will explore different ways to calculate returns using different metrics. 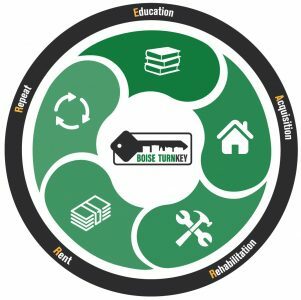 At Boise TurnKey, we have worked with investors from all over the world, each of them in unique financial situations with a different idea of what is an acceptable return. One of the services we offer is analyzing each individual’s goal and financial situation, helping them focus on an acceptable return to help them achieve their goals. What are your long term goals? Why do YOU want to invest in real estate? Newly listed property- for a link to the full MLS listing and all details, click HERE!! !